Dina's City Wildlife Adventures: Birds in a cow pasture. A pair! First time I've seen more than one. Cow (for all you city folks). I don't see cows that often around Tampa. Just on the highways on the way to Lakeland or Orlando. I headed up to Hernando county (about an hour north of me) to find some swallow tail kites. I had read on ﻿the Florida bird forums that there were big flocks of them flying around some dirt roads. I found those kites (posting those later) but also found a few other cool things. Yes, I think cows are cool. I should spend a day on a farm milking them. Then I might not think they are so cool. But they make cute pictures. I really like the white cow above. She looks like she should be wearing a bonnet. I also found a family of kestrels but they were pretty skittish. Somehow I managed to find the tiny loggerhead shrike. I almost drove right by it thinking it was probably a mockingbird. I also saw tons of cardinals and doves. I would have liked to have seen a meadowlark (I heard there were some there earlier) but didn't catch that one. Great shots Dina. Boom & Gary of the Vermilon River, Canada. Larks are heard and not seen. Love the cow with her sheepish head kneedeep in moo-food. Hope they have a salt-lick handy. Or maybe cows don't need them, with all those stomachs? The loggerhead shrike sure is cuter than its name suggests, isn't it? the cow is interesting and you are right.... never think of cows in Florida! Love those kestrels but the first cow looks a bit 'ornary' compared to the second. The second is in really good condition. Hi there - had to laugh at the "Field Guide to Farm Animals" bit for city folk! What do you mean milk comes from cows?! Brilliant Dina... many thanks for the last two ID's lol. OK. I'm joking, all are terrific! 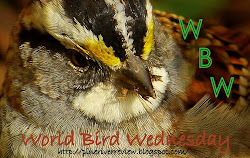 Great photos of the birds and an interesting excursion to find them. Lovely shots Dina. Looking forward to seeing the Swallow-tailed Kites. Nice going Dina, a double down on kestrels is quite a sight indeed. I know what you mean about cows having some kind of magnetism. Is it the forlorn look or the fact that I like milk products so well? Regardless, they are handsome beasts! Wow, I love the two kestrels together and the shrike is a cool sighting. The cows are cute. Great photos, Dina! Nice photos Dina! The Kestrel is really beautiful. I love the cow pics too - they're very appealing! The Kestrels are beautiful...and THE COWS are very cool too.